Suppleness is another mythunderstood word in the horse industry. Suppleness simply means the ability to bend without stiffness. We want the horse to have loose, pliable joints: his hocks, his hips, his knees, his shoulders, his poll and his jaw. There are other joints that must be flexible, too, but generally when we talk about a horse’s ability to bend, we’re talking about one or another of those major joints. If a horse stiffens any of these joints, that stiffness goes through his whole body. If the horse braces in his poll or jaw, for example, nothing else is going to be loose because he is locked against the rider’s hand and that stiffness is going to affect all his other joints to some degree. Stiffness or resistance in any joint causes a disruption of the energy flow throughout the horse. Smooth transitions are a sign of a supple horse and, vice versa, jerky, jumpy or jarring transitions signal resistance somewhere. Just as some people are more supple or stiff by nature, horses are individuals. Some have short bunchy muscles, short necks, straight pasterns, or other conformation traits that make flexibility more difficult to achieve. Others have long, lean muscles, long necks, and perfect shoulder and hip angles that make bending their joints very easy for them. There are a lot of different exercises trainers can use to help any horse become looser and more supple in his joints. The key is that these exercises need to be done while the horse is moving in order for him to become truly supple. There’s a lot of mythunderstanding in the horse industry about this. Stretching and bending the horse while he is standing still will not make a horse supple. Some trainers think stretching is the way to supple a horse so they tie a horse’s head around to his side while he’s standing in a stall in order to “supple” his neck. First of all, you’re not going to loosen and supple a horse without motion. Maybe there’s a little stretching going on here. And you can stretch a horse’s front leg and sometimes the horse will reach out and stretch his back down. You can do a little stretching with the horse standing still but you’re not doing anything to strengthen the muscles around his joints so you can’t make him more supple. Second, tying a horse in a position for any period of time is going to make him uncomfortable. So instead of giving to the pressure, he’s going to brace against it. Imagine if you slouched and a physical therapist decided the way to fix that was to tie your arms behind your head in some strange way and make you stand that way for several hours. You probably aren’t going to stand any straighter or get any looser. Instead, you’re probably going to tense your muscles and have muscles resisting and working against each other. There’s no logic to tying a horse into a pretzel with the idea of suppling him somehow. Finally, I don’t think I’ve ever known any horse, unless it had some sort of severe physical problem, that couldn’t bend his neck. Horses can reach around and bite our feet when we’re riding them and reach around and scratch their bellies. Most horses are pretty loose in their neck vertebrae. So the idea that tying their head around loosens anything and makes them more supple doesn’t make a lot of sense. So when you’re thinking about suppling a horse, you need to use common sense. The muscles around his joints have to be stretched and strengthened and he has to be moving to do that. You also can’t work on suppling the horse until he has achieved a certain level of gymnastic conditioning that comes from developing the muscles equally on both sides of his body so he’s straight, learning how to bring his hindquarters underneath himself to become balanced, and building the muscular strength in his hindquarters that allows him to move with impulsion. Trainers have to be aware of everything that can be affecting a horse. If a horse stays stiff or resistant despite gymnastic exercises, he may need to go back down the training tree a level or two to correct the problem. But sometimes there can be a physical problem causing his stiffness and it’s always going to be your job to figure out what is going on. We have a chiropractor visit regularly because we have some horses that need adjustments to help them stay loose and avoid stiffness. 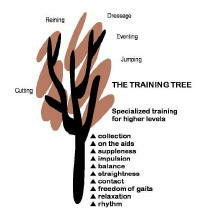 Until the horse achieves suppleness, he can’t attain the highest levels of training. It takes a baby green horse an average of 18 months to get to this point. When people take a horse to a trainer and expect to have a finished horse in 30 or 60 days they’re not playing fair with the horse or the trainer. That encourages short cuts that leave big holes in the horse’s foundation. Going back to plug those holes and unlearn bad habits can take a lot longer than taking the horse through the full training sequence in the first place. There are no short cuts if you want to play the upper level games right.